November 2008 marks the tenth anniversary of BBC Legends. In our latest competition we've teamed up with Medici Arts to celebrate a decade since the official unlocking of the BBC Archives. We have ten pairs of CDs to give away for those readers who answer the simple question below. 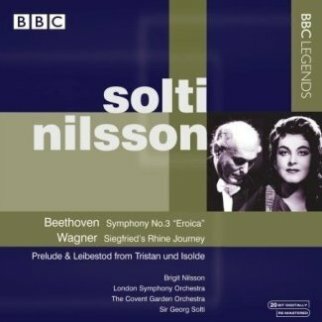 The first of these discs – reviewed here – features Sir Georg Solti conducting the London Symphony Orchestra in Beethoven's 'Eroica' (from the Royal Albert Hall 1968) and the Covent Garden Orchestra and Birgit Nilsson in Wagner (from the 1963 Proms). 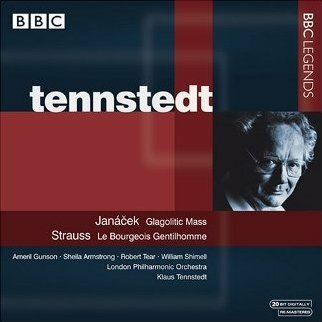 The second features Klaus Tennstedt and the London Philharmonic Orchestra in recordings of Janacek's Glagolitic Mass and Richard Strauss's Suite from Der Bürger als Edelmann, made at the Royal Festival in the mid 1980s. It was in October 1998 that BBC Worldwide signed a joint venture contract with IMG Artists to launch the BBC Legends label. Apart from releasing for the first time historic, live broadcasts performed by some of the greatest artists of the 20th Century, IMG Artists was also commissioned to bring back some of the 'lost' broadcasts and restore them to the BBC's Archive for release on BBC Legends, and for future broadcasting on BBC Radio 3. The aim was then and still remains today to enable classical music-lovers to listen to outstanding and often unique performances ranging from 1938 to the 1990s that would otherwise have remained forgotten in the archives. The first release in November 1998 comprised of 10 recordings featuring the Amadeus Quartet, Sir John Barbirolli, Sir Clifford Curzon, Kathleen Ferrier, Jascha Horenstein, Rudolf Kempe, Pierre Monteux, Evgeny Mravinsky, Sviatoslav Richter and Leopold Stokowski, with the label planning to go to 70 releases. In 2002, IMG Artists took over the management of the whole project maintaining its exclusive contracts with BBC Worldwide to compile, produce and internationally distribute the BBC Legends archive label. January 2007 saw the acquisition from IMG Artists of BBC Legends and the Royal Opera House Heritage Series by Medici Arts, as part of their global strategy to acquire classical archival content in both film and audio formats. Ten years on, the label has over 250 critically acclaimed CDs in the catalogue with a myriad of awards and accolades including the International Schallplattenpreis, the Cannes Classical Award, the Prix de Sutter (St. Cecilia Awards Belgium), the Diapason d'Or de L'Annee awards, numerous Diapasons d'Or, Gramophone Magazine and BBC Music Magazine 'Editor's Choice' awards, Chocs du 'Monde de la Musique' and ICRC awards. Some of the best sellers over the past ten years have included Sir John Barbirolli conducting Mahler's Symphony No.3, all the broadcasts of Dennis Brain, Sviatoslav Richter playing Debussy, Jacqueline du Pré and Mstislav Rostropovich playing Dvorak's Cello Concerto, Rosalyn Tureck playing Bach's Well-Tempered Klavier, Michelangeli playing Grieg's Piano Concerto, as well as numerous recitals by Dame Janet Baker. The label has also prided itself in bringing to the collector's attention a legacy of important live broadcasts of many distinguished artists, some lesser-known than others, including Shura Cherkassky, Annie Fischer, Mieczyslaw Horszowski and Tatiana Nikolayeva, as well as giants like Wilhelm Kempff, Arthur Rubinstein and Rudolf Serkin. The artistry of Yehudi Menuhin and the great Russian violinist David Oistrakh has been a major feature, as have notable vocal recordings from Arleen Auger, Kirsten Flagstad, Lucia Popp and Elisabeth Söderström. Every artist has brought a rich diversity to BBC Legends and to the collector, the excitement of a live performance. Emil Gilels in a recital recorded in 1980; Jascha Horenstein conducting Nielsen and Sibelius in 1970. 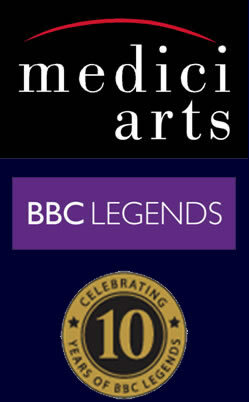 For more details about BBC Legends, see the Medici Arts Website. Sir Georg Solti and Birgit Nilsson joined forces for several recordings of Wagner operas in Vienna for Decca, which was the first? Email your answer, name and address to competitions@musicalcriticism.com by 15 December 2008. We will not pass your details to any third party, but please indicate if you do not wish to receive further correspondence. Rules, terms and conditions: 1. This competition is organised by MusicalCriticism.com and Medici Arts. 2. MusicalCriticism.com reserves the right to cancel or amend the competition at any time without prior notice. Any changes will be posted within the competition notice. 3. In the event of a dispute regarding the terms and conditions, conduct, results and all other matters relating to this competition, the decision of the Editor or Deputy Editor shall be final and no correspondence or discussion shall be entered into. 4. The competition is open to residents of the UK only. 5. Contributors and employees, their associates and members of their families and households are not eligible to enter. 6. Only one entry per person is permitted for this competition. 7. Entries received after the closing date of 15 December 2008 will be automatically disqualified. No purchase required. 8. The winners will be chosen at random after the closing date, from all correct entries received by 11.59pm on 15 December 2008. 9. Prizes are non-transferable. No cash alternatives will be offered. The winner will be notified by email and the prize delivered by post.